Ciao! Welcome to our 12th Italian Food, Wine & Travel group as we travel to central Italy to the region of Umbria. Earlier this week I shared a preview of Umbria with an overview of the region. Early this spring I wrote a comprehensive guide to the grape sagrantino from Umbria and a food pairing with sagrantino. Today I'm sharing with you an wine tasting I attended this week with a panel of winemakers from Montefalco with the Consorzio Tutela Vini Montefalco. I’m always honored when I get offered wine to sample. It’s not only an opportunity for me to taste new wines from producers, but it’s all about education and learning the ins and outs of the grapes themselves, the regions they come from, the cuisine and the culture of that region. The vines in Montefalco are rather young and only about 15 years old. The traditional version of sagrantino was more of a passito, dried grapes, style, which is still produced today. These wines are sweeter in style, but due to the strength of the tannins it doesn't produce a cloying wine. A lot has changed in the area from 15 years ago when there were only 100 hectacres and today there are about 700 hectacres and 70 producers. Here are some highlights from the panel discussing sagrantino. Marco explained that they just started harvesting the sangiovese and merlot grapes. Sagrantino, the flagship wine of Umbria, is harvested later in the first days of October this harvest. Colpetrone produces more than 200,000 bottles with majority of the wines under the Montefalco Rosso label so it's a very important wine for them. Their '11 Montefalco Rosso is made up of 70% sangiovese, 15% merlot and 15% sagrantino. The choice of the grapes blended on the Montefalco Rosso is the particular style of the winery and the grapes they choose for the blends. Retails for $14 and the importer in the USA is Vias Imports. Unfortunately we weren't able to sample their wine due to shipping issues. This winery is not currently present in the USA with their wines, but only with their extra virgin olive oil which they started producing in the early 1960’s. Last year was a tough year for Umbria as well as many other regions within Italy and 80% of the olive harvest were lost. They started producing wine in 2000. The '11 Perticaia Montefalco Rosso blends with their sangiovese the colorino grape, which is used a lot within the region of Tuscany in the wines of Chianti. It helps smooth out the sangiovese. Perticaia uses stainless steel for their wine production. Balance is important for Perticaia to extract the sweetness of tannin as well as extraction of flavor and color. Alessandro stated that a short maceration doesn’t reduce tannins because they macerate some of their wines for over 60 days. Many factors come into play including how many times a day they do pumpovers as well as the temperature of the maceration. This wine retails for $25 and their importers vary state to state with Ideal Wines (MA), Artisan Wines (CA), Zigzigando. Filippo described sagrantino as a grape that has good structure and a good quality of tannins. Tannins that aren't drying, but ripe tannins that help with ageability. They are the muscles in the wine. A request to change the laws within the appellation to increase the amount of sangiovese and sagrantino allowed in the wines of this area. This allows producers to use native varieties at higher percentage levels. I had questioned him about the different of sagrantino today vs. the past. Filippo mentioned that in the past smaller barrels were used that extracted more where today larger barrels are used that extract less. Per Antonelli in the last decade the best vintages of sagrantino were '04,, '06, '08 and '10. This wine retails for $40-45 and their importers are Omni Wine (NY), Grappoli (DC), Cream Wine (Chicago), Tosca Wines (CA). The 2008 that Liu shared was a traditional vintage for them. It was first fermented in big oak with a long maceration. This wine was aged 24 months in big oak barrels and 24 months in small oak barrels. It retails around $40 and the importers vary with Selected States (NY), Vinity Wine Company (CA), Vino Vero (TX), Down EastSelections (WA), Volio Vino (CO). Lucca offered food pairings suggestions with sagrantino with meat being the best option. Sagrantino is a great wine to experience the changes in the glass throughout the meal. Their wine retails $35-40 and their importer is Palm Bay. 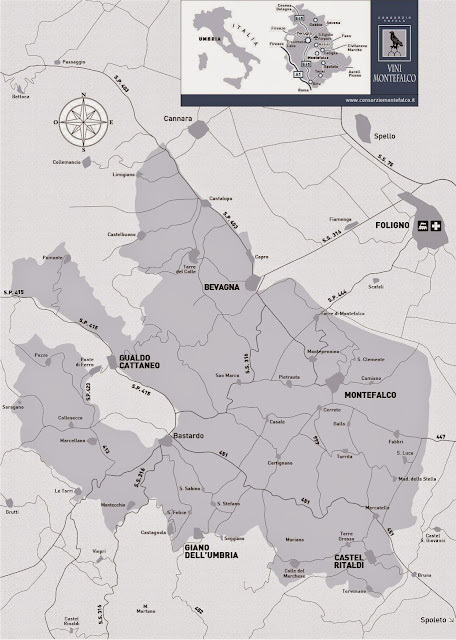 Arnaldo-Caprai is one of the most popular wineries of this region with 130 hectacres. Marco stated that sagrantino can age for more than 20-30 years as well as the rosso montefalco. His food suggestions were steak, rack of lamb and matured cheeses. Per Marco the best vintages of sagrantino were '09, '10, '11. His wine retails for $60 and the importer is Folio Wines (CA). Stated by Filippo Bartolotta sagrantino has igh acidity and tannins that are "screaming for juicy meat". 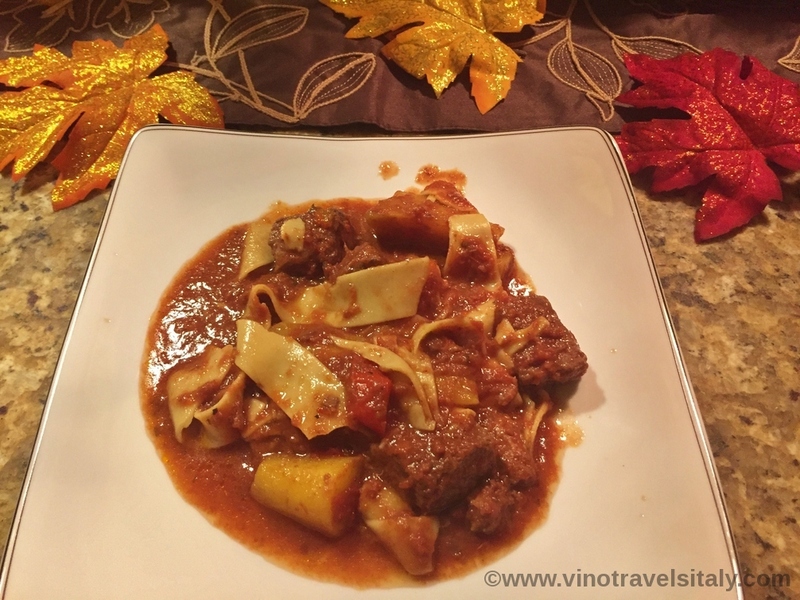 I paired my sagrantino with a beef stew served over pappardelle and plan on preparing another Umbrian dish known as strozzapreti. Strozzapreti are dumplings with meat sauce. Alessandro of Perticaia also had with his rosso sagrantino before this meal another Umbrian dish, strangozzi that is very similar served with pieces of sausage and black celery from the nearby town of Trevi. Continue on our Umbrian journey with other fellow bloggers. 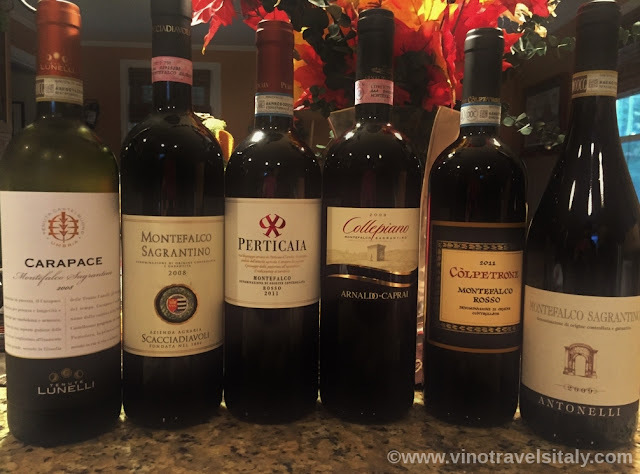 Don't forget to join our live chat on Twitter at #ItalianFWT at 11am EST. We can't wait to her about your Umbrian experiences.